On 29 June-1 July 2016, the inaugural meeting of the inclusive framework for BEPS implementation took place in Kyoto, Japan. The OECD has launched an inclusive framework that allows all interested countries and jurisdictions to work jointly for the implementation of the package of measures against base erosion and profit shifting (BEPS), with the status of Associates. Together with OECD and G20 countries, they now work on an equal footing in the OECD’s Committee on Fiscal Affairs (CFA) to develop international standards related to BEPS and to review and monitor the implementation of the whole BEPS package. The first meeting in Japan gathered more than 80 countries and jurisdictions, among which a broad group of developing countries. Direct participation to the Committee on Fiscal Affairs and its subsidiary bodies: since 2014, 17 non-OECD and non-G20 countries joined the CFA and as of June 2016, 57 new countries and jurisdictions are involved in the CFA’s work, either as Associates or Invitees, raising the number of delegations to 103. 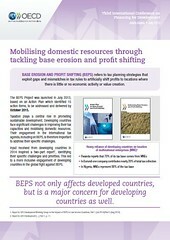 With the establishment of an inclusive framework for BEPS implementation, all interested developing countries can join the BEPS project on an equal footing with other countries to tackle tax avoidance, to improve the coherence of international tax rules, and to ensure a more transparent tax environment. The inaugural meeting took place in Kyoto, on 29 June - 1 July 2016. As of June 2016, approximatively 40 new countries joined the Committee on Fiscal Affairs and its subsidiary bodies on an equal footing with OECD and G20 countries within the inclusive framework. Three Regional Tax Organisations - the African Tax Administration Forum (ATAF), the Centre de rencontres et d’études des dirigeants des administrations fiscales (CREDAF) and the Inter-American Centre for Tax Administration (CIAT) - are also directly involved in the Project. ATAF, CIAT and now CREDAF are Observers in the Committee on Fiscal Affairs, ensuring a permanent representation of their members. Through their direct involvement, countries are able to provide input at the working and the decision-making levels, and to ensure that their specific concerns are taken into account in the solutions developed to tackle BEPS. These regional organisations also have a specific role in the toolkit process, gathering input and coordinating joint work.. Regional meetings are being set up for an ongoing and more structured dialogue process with a broader group of developing countries. They allow the OECD Secretariat to update them on the latest technical developments and local implementation issues, but also to get their feedback on the work performed. During the previous rounds of meetings in 2014, 2015 and early 2016, almost 60 countries participated in the regional meetings, feeding their input into the BEPS Project. For the second semester of 2016, new consultations are planned in 4 regions (Africa, Asia-Pacific, Eastern Europe & Central Asia and Latin America & the Caribbean). These regional meetings aim at enhancing the overall dialogue process, by feeding the Working Parties and the plenary of the Committee on Fiscal Affairs with priorities and challenges for developing countries. They also provide a more targeted and coordinated offer for capacity building within the region, both through reinforcing the regional dialogue on this issue and by linking to and engaging with BEPS capacity building work by OECD and other regional and international organisations. The OECD carries out bilateral country programmes to provide support on specific international tax issues such as transfer pricing (see the Tax & Development activities). The OECD also offers multilateral and regional seminars, through the Global Relations programmes (see the Global Relations activities). In addition, the Tax Inspectors Without Borders (TIWB) programme - a joint initiative of the OECD and the United Nations Development Programme (UNDP) - aims to support developing countries to build tax audit capacity. In a real-time 'learn by doing' approach, TIWB facilitates the sharing of expertise by the deployment of experienced tax auditors on a demand-led basis to developing countries. Under TIWB, tax audit experts work directly with local officials in developing country tax administrations on current audits, which can cover both direct and indirect tax audit issues. Strengthening tax systems in developing countries is a key development priority and a core part of the Sustainable Development Goals framework agreed at the UN in 2015. Tax revenues raised in fair and efficient ways are required to meet the global development challenges. In April 2016, four international organisations (IMF, WBG, UN and OECD) launched the Platform for Collaboration on Tax to boost global cooperation in tax matters and provide governments a better support in addressing the tax challenges they face. One of the Platform's main tasks focuses on the work on toolkits to assist developing economies in implementing efficiently BEPS action items and addressing additional specific tax issues. To ensure that these toolkits meet the demands of developing countries, consultations are held through specific events (regional meetings, Global forum meetings, meetings organised by the cooperating other organisations) and online (surveys, written consultations, webcasts). These toolkits containing reports, guidance, model legislation, train-the-trainers materials and other tools are designed to support capacity building. The first toolkit on Tax Incentives was released in October 2015, providing an in-depth analysis of the efficiency of tax incentives and formulates recommendations regarding best practices. The other toolkits will be published in 2016, 2017 and 2018. In addition, Platform members will now hold regular meetings with representatives of developing countries, regional tax organisations, development banks and donors. Consultations with business and civil society will also be organised as needed.